It’s that time of year again when digital stats aggregators update their numbers and various annual summary reports come out based on research conducted in the previous calendar year. Here are a few general highlights I put together recently after going through various reports. If you’re interested in the data sources, I covered my favourites in this blog post last year. Most have now come out with 2018 versions of their reports. The global digital landscape continues to grow rapidly. There are now 4.1 billion internet users, which is 52% of the world’s population. A quarter of a billion new users came online for the first time during the past 12 months. The average internet user spends around 6 hours each day using the internet. When factoring in 4.1 billion users spending this amount of time, 1 billion years will be spent online in 2018. While Asia continues to grow its dominant share of overall internet users, Africa’s users are growing at the fastest rate. It will soon overtake Latin America and Europe to permanently claim the #2 spot. 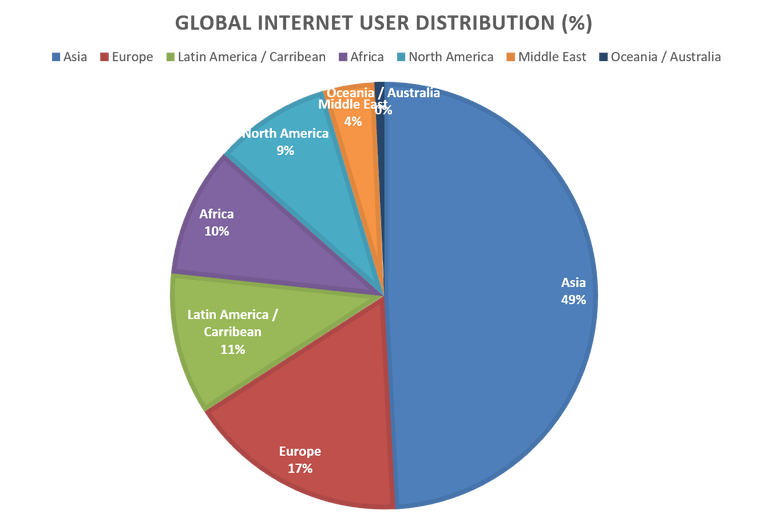 This can be stated with confidence since global internet user distribution will eventually match the actual global population distribution (once penetration rates close in on 100%). North America has reached 95% penetration and the growth rate has slowed down considerably relative to other regions of the world. As a relative percentage of total global use, North America is at 9% and falling. It is widely predicted that voice control will soon replace keyboards and typing, especially for search and social media interactions. Already, nearly ¼ of internet searches are voice-driven. These voice queries are getting increasingly complex and AI is being used to learn from them (e.g. Google Home and Amazon Echo). In total, over 5 billion people own a mobile device of which more than 200 million people got their first one in 2017. What’s even more staggering is that over half of these devices (57%) are ‘smart’ devices allowing for a rich internet experience. The monthly mobile data used by the average smartphone user globally is 2.9GB and 7.1GB in North America. This will only increase as 3G and increasingly 4G/LTE networks are becoming more commonplace in developing countries and 5G networks are expected to soon transform the nature of the global mobile internet. At present time, Android holds 74% market share vs 20% for IOS and 6% for other operating systems. Mobile has established a primary position around the globe. It now accounts for over half of all digital minutes in 13 markets, and over 75% in Mexico, India, and Indonesia. The extent to which different countries rely on mobile vs. desktop varies considerably. Some markets are dominated heavily by mobile-only internet users, while multi-platform internet usage is the norm in others. Trust and user experience are traditional barriers to mobile commerce. With the popularity and constant data-driven evolution of massive online commerce platforms such as Amazon and Alibaba, user barriers have been greatly reduced. This has contributed to the staggering growth rate of these platforms which show no signs of slowing down. Globally, consumers/citizens spend more than 95% of their app time on their 10 most regularly used apps, often drawn from a relatively short list of top overall apps that contribute the majority of app time spent and are most likely to be found on users’ home screens. The top use of apps in most markets is social networking and instant messaging followed by gaming. Note: I like to point out that many people responding to surveys tend to lump instant messaging into social networking (e.g. Facebook Messenger and Facebook proper). Whenever possible, look for studies that differentiate between the two. It’s important to differentiate between instant messaging and social networking. The former is sometimes referred to as “dark social” since it occurs off the public web (typically linked to a phone number) and is often encrypted and used as a conversation tool between individuals or individuals and groups. Facebook’s Messenger is the most widely used messenger in the world, followed by WhatsApp (owned by Facebook), QQ and WeChat (both owned by Tencent and dominant primarily in China). While many countries have specific IM’s developed and used domestically (e.g. QQ, Viber, Kakaotalk, VK Chat), the dominant global IM’s are still very popular in those countries as well. The #1 spot tends to vary from region to region. In the USA, Canada, and France, Facebook Messenger has the top spot whereas WhatsApp has dominance over most other countries. This number represents close to 72% of all internet users. Most people access social media via their mobile devices. While Facebook is the clear market leader and dominates the social media space by far, both YouTube (owned by Google) and Instagram (owned by Facebook) are also currently major global players. Since internet penetration rates in China are still relatively low compared with other regions but growing rapidly, social networks such as Qzone, Sina Weibo, Baidu Tieba, and YY can be expected to grow significantly in the coming 24 months. Qzone, is expected to reach 1 billion users by the end of 2018. While globally Twitter’s numbers (330 million monthly users) are far lower than that of Facebook or Instagram, one of its often-overlooked unique characteristics is that every tweet is essentially its own public webpage with a unique identifier. Historical data can be purchased back to the very first tweet in 2007. This makes it very useful for monitoring and various advanced forms of social network analysis using big data. It has recently been experiencing growth in Central-Asian markets. Most of the major social platforms are now encouraging users and brands to become broadcasters of video content. This sort of content is given algorithmic prioritization as an incentive to produce more of it. Users have embraced it and brands are increasingly experimenting with integrating live streaming into their social media strategies. Expect to see an increasing number of brands use AI-driven chatbots to improve user experience online. As an entire generation grows up used to the simplicity of instant messengers and the ability to ask a question 24/7, the nature of websites, social platforms, and customer support is expected to change drastically. Some see chatbots replacing websites altogether as few people will be willing to “search” for information instead of asking a bot to find it. The media culture has shifted considerably in 2017. While the term “fake news” has been trending all year as a popular search term on Google, a more accurate description is misinformation, defined as “false or inaccurate information, especially that which is deliberately intended to deceive”. This is happening more than ever online and subsequently trust in media, institutions, and brands have seen a tremendous decline. Increasingly peer influence is on the rise, however, it comes with its own set of challenges such as the dangerous echo chambers (filter bubbles) that it can create. There is a growing use of social media as the starting point for product research as opposed to traditional Google searches. While Google searches often point to social platforms, if a user is starting with YouTube or Facebook then brands/organizations need to be even more aware of what their target audience is finding on these platforms and optimize their social presence accordingly. That’s it for now. Let me know if you’re looking for something specific and I’ll try to point you in the right direction.